Welcome back to The Self-Worth Challenge. Each week I am addressing a topic related to self-worth. At the end of each post I include a few questions to help you consider how you value yourself and how to strengthen your self-worth further. Although this will only take you five minutes or so, it will set you up to consider this aspect of your self over the coming week. If you are new to the challenge you might want to start at the beginning and work your way through the series. The very first post is linked here. Last week in “Own your Strengths’ we worked on owning our strengths and explored how that felt. This week we are moving on to the importance of expressing ourselves. A very big part of respecting who we are involves expressing ourselves. Your perspective is important even if it differs from those around you. When we accept that what we feel is important and begin to voice it then the life we lead feels better in so many ways. Whilst it is not always an easy thing to do, expressing ourselves clearly and appropriately helps us on so many levels. There are varying reasons and beliefs, (other than a low of self-worth), that stop people from verbalising their opinions or saying ‘No’ when necessary. Some of us are taught to fear asking for what we want or saying how we feel. Negative reactions in childhood can leave us deciding that it is better to fit in and not voice our opinion. The problem is that in adulthood we can start to feel left out of the equation. One of the common fears is that we are being selfish by saying what it is we want. However, expressing ourselves is not about overriding other people, it is simply about putting out there what we think or what is important to us. Valuing ourselves is not about becoming demanding or forcing others to do what we want. We can also fear that others will disapprove of what we have to say (or that we might be making things more awkward) but in the long run being open about what we want/feel is the best policy. People generally know when we are unhappy about something anyway. We communicate much more through our body language than we do through what we say. It can actually be quite challenging dealing with someone who clearly doesn’t say what they want because we know that they are not happy but have no idea what would help. Much like the way we teach our kids, expressing ourselves is not about saying ‘You must do this for me’ or ‘I want this now’. We can still respect someones rights and feelings whilst having our own differing opinions. This is not about a temperament type. It is not being quiet or noisy or an introvert or extrovert. People can talk a lot but say little, not actually expressing what is important to them. People can also talk a little but say very clearly what they need. If you are aware of what you need or want, say it. Using the statements below might help if you are nervous of coming across demanding. When we start a sentence with ‘I..’ it is helpful because it automatically makes it about us and stops our words sounding confrontational. Know that it is not about always getting what you want but rather about voicing what is important to you. Some outcomes we are in control of. We can say ‘No’ to a request, for example, but sometimes we don’t have control. Often people hold back in these situations because they know that if they ask but don’t get what they want they will feel rejected or offended. Not asking in case we don’t get something limits us. If we ask, we might not get what we want, but we just might. Also, when we engage with people fully it changes how they are with us in the long run. One tough thing for many of us is to say ‘No’ when we are asked to do something. 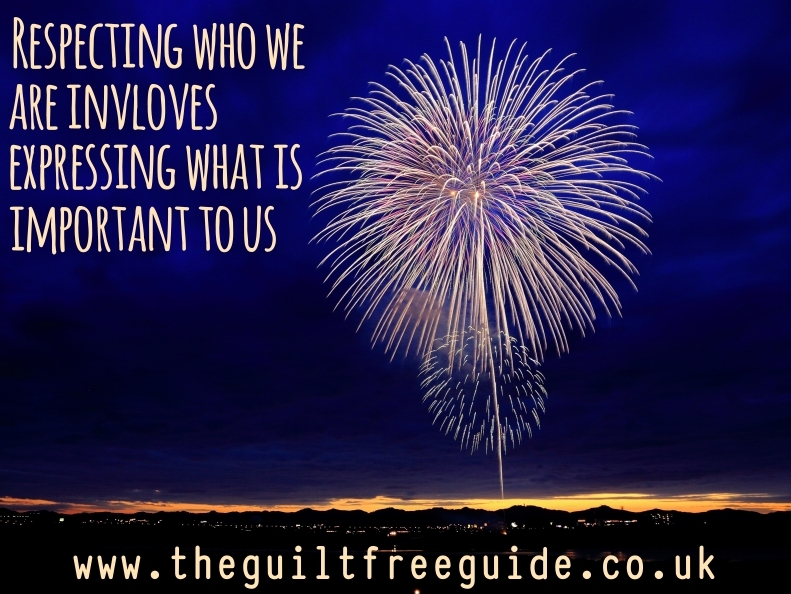 We can feel guilty or selfish, particularly when we can find no reason other than we don’t feel like it. The problem with saying ‘Yes’ to things we don’t want is that we end up either stressed/overworked/resentful or we have to find ways to avoid the situation when we could have saved ourselves a lot of effort by being honest up front. ‘I would love to but.. Some situations, however, do not call for a direct ‘No’ but we may feel concerned about accepting in which case asking for more time or information can help give us longer to make the decision. So on to the questions for you. Do you say what is important to you? Can you say ‘No’ when you don’t want to do something? Some people struggle with expressing themselves. If you fall into this camp then the challenge is to find those times when you don’t speak up and just notice when they are. At first practice in hindsight. So maybe you were asked to help out at an event and wanted to say ‘No’ but said ‘Yes’. It’s okay. Replay it in your mind with how it could have been. Then when you are ready, start doing it in real life. When you are changing the way you behave it is normally best to start small and build up. Pick safer situations until you have practice before launching into more difficult ones. It can be uncomfortable to start with, particularly when you are doing something that people do not expect of you. However, with time everyone adjusts and it allows for a better connection between yourself and others. Some people do express themselves but are defensive or very forceful about what they are saying. This group have discovered their voice but at some level, underneath there assertions, they actually feel uncomfortable about it. Maybe deep down they fear being criticised for having their own opinions or really think that they ‘should’ do what others want. If you fall into this group then practise voicing your opinion without lots of justification. Reassure yourself that what you feel and think is valid. Lastly but not least, it is always important to remember that we have a right to change our minds about something. I would be love to know any aspect of this that you would like to share with me. I am aware that these journeys are often very personal, so if you would rather not it would still be great to know you are following along. I will respond to all comments. My lack of expression definitely comes from my childhood. I wasn’t allowed to have opinions and feelings and whenever I did express them, I was always in the wrong for having those feelings and opinions so often times, I kept my mouth shut. Then I became an adult and discovered my voice but was overbearing about it. I even lost a friend by being that way. Someone I really valued but wasn’t willing to accept my apology when I realized that I was wrong. Now, I am very conscious of how I word things. It’s hard when I get mad about something though because sometimes I find myself (at least in my head) resorting back to my overbearing self but I do my best to make the effort to express myself appropriately! I’ve come a long way in my healing but communication is sometimes still tricky for me. Thanks so much for this post! You’ve given me a lot to think about. Michelle recently posted…To the Christian Zealot: Stop Judging Others! Hi Michelle, It is tricky at times there is no two ways about it. Emily recently posted…#WeSoFancyDress – A back to school party featuring ASDA! Now that I am 40 something I have no problem saying how I feel even if it’s going to offend someone. But in my 20’s I was mousey and rarely spoke up. Probably why I had a lot of failed relationships because by the time I did speak up it was too late. Thank you again for sharing another great part to your summer self worth challenge with #momsterslink. Truly brilliant. It is funny how we are taught on one level to put others first but the reality is that we have to respect ourselves and value ourselves to have other people do the same. these are life lessons that come with time, experience and a bit of reflection. Have a a great week Mackenzie. Another great post in this series – lots of wise and useful words which will be lots of use. Thank you! Hi Lisa, This is not just you and it is genuinely hard to stand against the tide (I have by no means mastered this one either). For me personally it us about speaking up with no thought that I have to achieve a particular outcome. It takes the pressure away. Also using ‘I’ statements can help. ‘I see what you are saying but I feel…’ or ‘It seems to me that..’. It is ironic that in life we often create the things we try to avoid. It is as if no matter what we do, confront things head on or try to avoid them, we will be confronted with them anyway so that we can learn!! Great post. This is something that I work on daily. My husband and I have promised from the beginning to not “play those games” where we dance around what we are really thinking. It’s challenging but way less exhausting than hoping he figures stuff out on his own, because he won’t. 😉 Regardless, I was a shy kid and those feelings do linger. Thanks for sharing w/ #heymomma! casey recently posted…Running, Gardening, Baby Shoes, and Hey, Momma! Link Party #8! I’m ok with expressing myself and asking for what I want (I always figure the worst that can happen is you don’t get it and you’re no further back!). I’m not too good at saying no to covering extra shifts at work – I can if there’s a good reason, but not if it’s just because I don’t feel like it – I think that stems from when I have asked people to cover in the past and they don’t have a great reason for saying no, I know how much it annoys me. It is great that you do express yourself. I find it very easy to speak up, but very hard to say no. I’ve never really thought of those two things as being related. Definitely food for thought. Thanks for being part of #TwinklyTuesday. Yes, it is good to be more open with people and then receive that back again. Thanks Jenny for hosting. Oh sometimes I am just terrible at expressing myself! I get all twisted up in knots. I needed to read this today. Thank you!